This old recipe needed a much more appetizing photo, so I'm using the flan my youngest uncle's wife made and brought to my Thanksgiving dinner. I added bits of crushed ice on top, just like how my mom serves it. Original commentary and recipe below the photo. Flan is a super-simple dessert that's very easy to make. There are only three ingredients, four if you want the coconut milk variation. And it's a good way to use up milk or eggs, whichever is closest to expiring. You should set out your ramekins first. The hardest part is getting the sugar to caramelize. 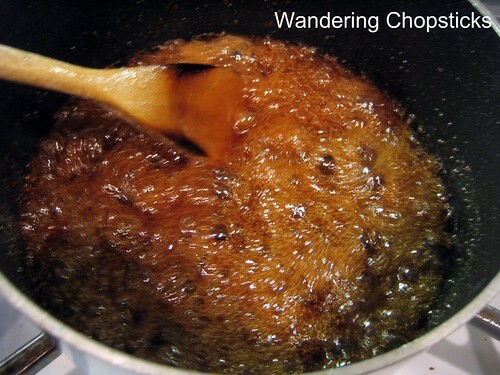 In a saucepan, add 1/2 cup sugar and 1/3 cup water. Start the heat on medium-low so that sugar is evenly dissolved. Then turn the heat up to medium-high. Watch this closely because you don't want the mixture to burn. The sugar should start boiling and thickening. Once it becomes a frothy mixture like the picture below, immediately take the pan off the stove and pour into the ramekins. If this step is too confusing for you, follow my directions for How to Make Nuoc Mau (Vietnamese Caramel Sauce). I really do mean immediate. The caramel is basically burnt sugar and will start hardening the minute it's off the stove. 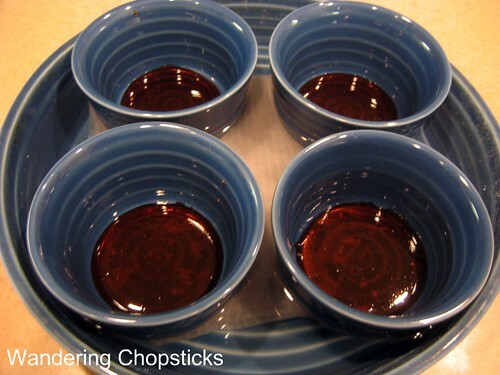 Pour into the bottoms of the ramekins. Set the ramekins into another pan that has been lined with paper towels. The paper towels serve to stabilize the ramekins. Pour water into the outer pan and fill halfway. The water will serve to "steam" the flan in the oven. In another pot on low heat, melt 1 cup sugar into the milk/coconut milk until sugar is dissolved. 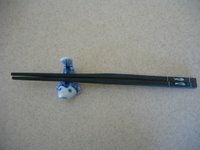 Taste and adjust sugar if necessary. This serves merely to melt the sugar evenly so the mixture should be lukewarm. Beat 8 eggs into the milk/sugar mixture. Then, using a strainer, pour the mixture into the ramekins. This will remove any bigger eggy chunks and leave a smooth consistency. That's it. Put the pan of ramekins into the oven for about half an hour at 325 degrees. The flan will be done when a knife inserted into the center comes out clean. You can also shake the ramekin to see if the custard has set. If it still seems too liquid, then it's not ready and you need to bake it longer. 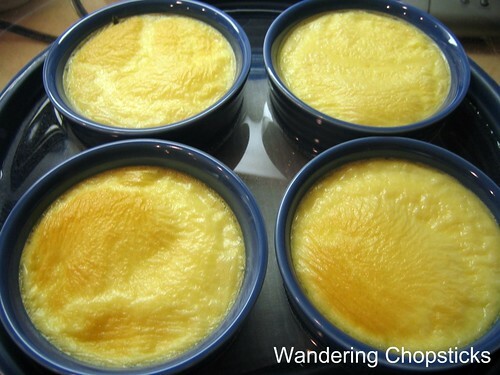 Allow the flan to cool down, then refrigerate before serving. If you don't want to cook flan in the oven, you can also steam it. No paper towels or second pan necessary if you're steaming your flan. Just put it on the steamer tray. Test for doneness after half an hour. Refrigerate. 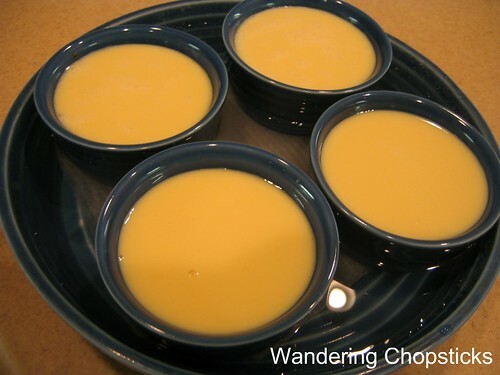 To serve, slide a knife around the outside edges of the flan to loosen it from the ramekin. Put a plate over the top. Flip. The caramel now becomes the top. 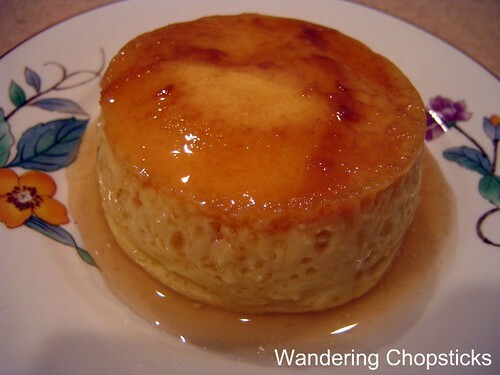 My mom used to serve this with crushed ice on top and around the flan. And here's the original photo from 2006. Not horrible, but the new photo is way more appetizing, isn't it? Hi WC - Very nice recipe, and so simple. I enjoy the step-by-step flip card style photos! I have now forgiven you for the Scottish kilt photo that so scarred my fragile little mind. Have you tried it yet? How'd it turn out? it sure looks light and fluffy. i like light and fluffy flan. Yup. Thanks. 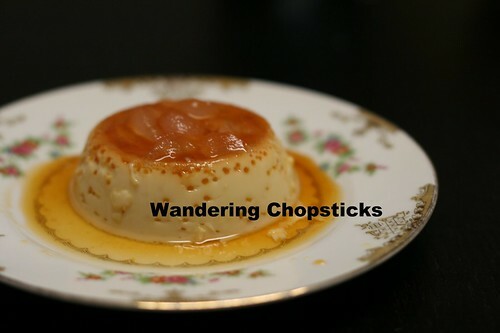 But Vietnamese flan is not as dense as some other styles. This version is still plenty smooth and rich. Vietnamese flan is the best! It's light and airy. It's hard to eat Mexican flan because of its richness and density. Have you made the Vietnamese coffee version? It's sooo GOOD! I haven't done coffee yet, but that sounds great. I've been meaning to re-do this recipe and haven't even had time to do that! Oooh, that sounds delish! Both of those sound delish!